Ummmm, yummy! I've never been brave enough to try to make homemade cinnamon rolls...or any kind of bread for that matter. I've seen you and several blogs and realized I hadn't invited you to mine (it's private), so if you're interested, email me at leah.lcs@gmail.com and I'll throw you an invite! I remember seeing these all over blogland a while back. They look delicious! 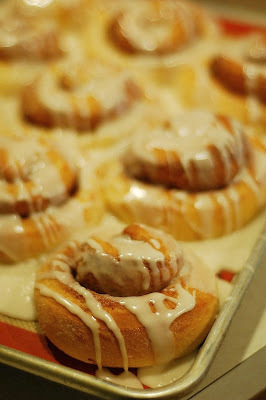 OOOOOOO WHAT a good wife and mama you are......making simple cinnamon rolls.........yummers ! kisses to baby Kate from Auntie Queen b! Those look good. I can't imagine doubling the recipe though. That's a lot of cinnamon buns. These look so delicious! I made them a month or two ago and froze them. They baked up beautifully and were a hit at work. Hope you and the family are doing well & getting some sleep! These are everyone's favorites. I haven't made them in a while. You have inspired me. They look fantastic and the recipe sounds easy! Thanks for having this here. Thanks a lot for sharing this recipe Dear. I tried this a couple of hours ago..followed everything you said and everything turned out really good! Those look really good. I made a batch a few weeks ago that are really easy too. I used my bread machine which made it even easier. The recipe is on my blog if you want to give it a try.